I don’t even remember the year, but I know it was a cold Utah winter when I started the story that would eventually become Bumpy Landings. Probably 2003 or 2004. It was a long time ago, that’s for sure. The story evolved as I picked at it through the years. While there are a few autobiographical elements in the final version, Jordan MacDonald and his story were much closer to my own personal reality in earlier drafts. Letting Jordan have his own life and adventure was an important shift in my writing, as I had to develop ever increasing empathy in order to look outside myself for character motivation and understanding. Finally, in 2007 I decided to get serious about my writing. I began following following a number of author blogs, and shared my writing for the first time while attending my first LDStorymakers conference in 2008. I pitched the story to Covenant at the 2009 Storymakers Conference. They didn’t take it, but gave me valuable feedback that I used to strengthen the story. That fall, I submitted the re-worked manuscript to Cedar Fort. 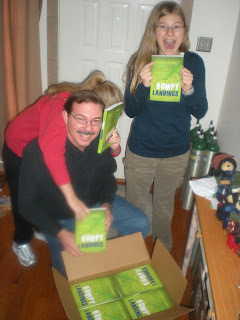 They accepted the book in the spring of 2010, for publication in January of 2011.